Finally, here's my first interpretation of the White Scars. I'm working on a squad of biker scouts, but I thought I'd use a fully armored marine pictured here for the sergeant. White is a tough color to work with, especially when it's for a chapter that is supposed to be as rough and ready as the White Scars are. I used brown washes and blending to shade the white. I also made a major departure from the traditional shoulder pad and chapter icon colors, using an orange background with as much black as I could work into the icons. The red trim colors on the cloak and stripes on the bike is darkened a bit also. There's not as much room for stowage on these lighter bikes, but I managed to strap a holstered shotgun to the front fork, and I stuck part of a backpack from a plastic Warzone miniature on the back of the bike to represent stowage. The parts that hung from the backpack look like they're blowing in the wind when turned on their side! To keep the contrast under control, I avoided using black for anything, instead using dark brown, gray, and steel for the mechanical parts on the bike, and the base. I like to use a custom base for bikes to keep them small (about the size of a shadow, really). 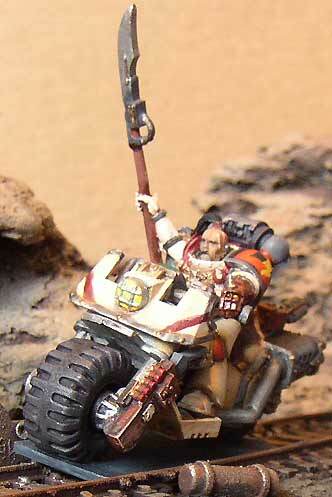 Bases allow you to pose the bike in a lean, for a more dramatic looking model. 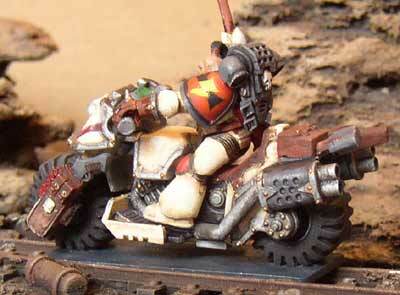 I knew I wanted to do scout bikers for the White Scars, and although I had a set of the new metal scout biker models, I wanted to do something a bit more primitive to bridge the gap between the horse riding warriors of Mundus Planus and the full fledged Space Marines of the chapter. 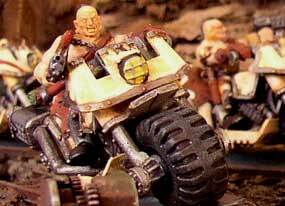 I finally settled on legs from the old plastic Goliath ganers, since they were wide enough to straddle the bike and almost reach the foot plates, and angled them where they would meet the torsos to approximate a seated position. I used torsos from the new plastic chaos marauder minis (which are awesome btw), and arms from anything that could hold a weapon or reach the handlebars. I spliced marine biker hands onto the arms to get them to hold on- important since I was going to be swapping scouts out for regular marines at some point and couldn't glue them in place. I used heads from the old plastic marine scouts, and trimmed the mohawks down to just a top knot. I love those heads, they're so expressive, especially for such old models... 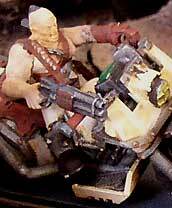 The shotgun arm on the scout above is also from an old plastic Goliath model, filed down slightly so it wasn't too bulky for the rest of the model. The bare torsos and arms on the scouts meant there wasn't a lot of places to paint color other than the legs. I settled on dirty white for the pants, steel for the shin guards, leather for all the straps and pouches, and grey for the furs. I used a dark brown wash to help define the edges of the straps, armor, and weapons. The rider on the left is the shotgun guy again, the one on the right has an autopistol. I made a third scout with a flamer too.